This is a snippet of a handout that is a follow up to a previous percent activity that I posted. 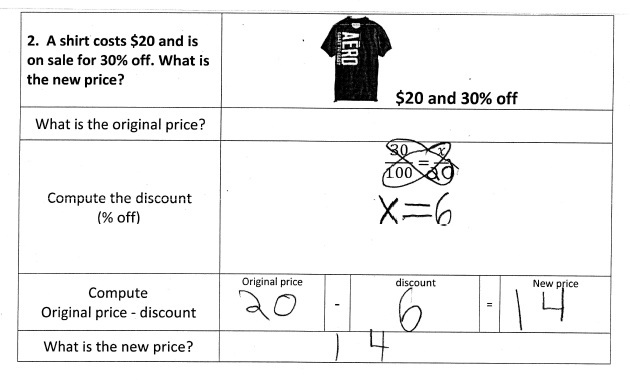 It walks students through the mathematical steps including subtracting the price. I found that the cutting part of the previous activity was effective but the steps were not as clear. This handout is an attempt to clarify the steps. What is surprising is how confused and challenged students are by simply computing the new price. Part of it is working memory and part of it, I believe, is learned behavior. Students are trained in math to simply follow steps without understanding the meaning of the steps. I ask them what the 6 represents in the problem above and many are unclear. Here are the full handouts worked out by this student. The tax part of the first handout has the discount rate and not the tax rate listed – error. I corrected this after the lesson. BTW, this student has autism and struggles to complete work in class. He took a long time to complete it. One problem is that he doesn’t have the personal experience and prior knowledge about discounts and taxes. To supplement this he would be given money and an item to buy and act out the actual purchase of the item to see how he pays less money.